Since I’ve been posting so many miniature themed projects, I thought it would make a nice change to do something completely different. 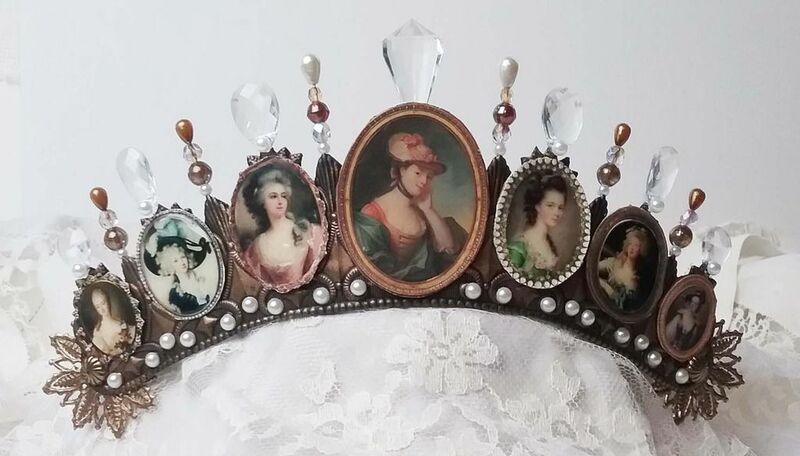 In this post, you'll find a video tutorial covering how to make four different wearable crowns that range from easy paper crowns to more complicate wire framed crowns. First up, is the sparkling Ice Queen crown. 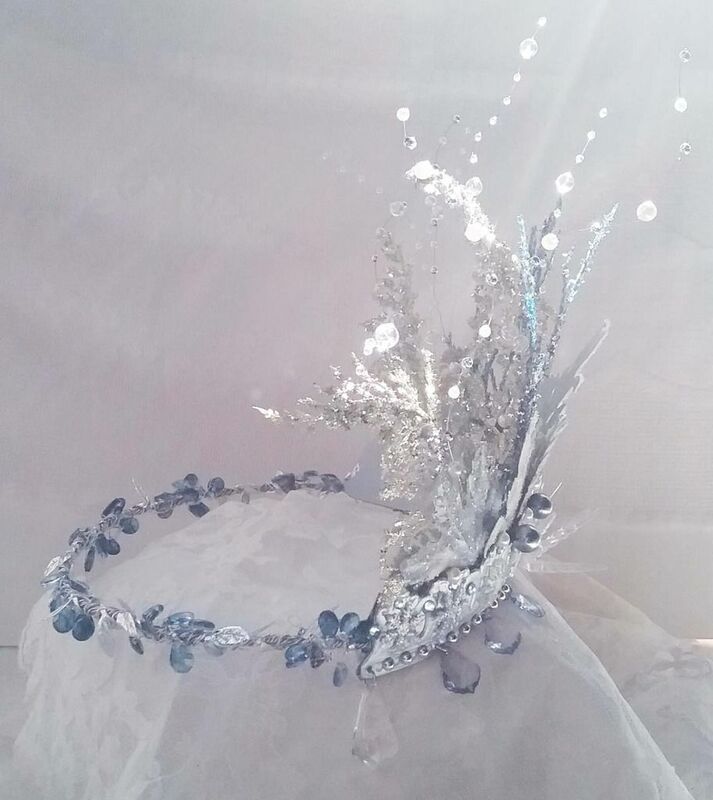 The base of crown is made from twisted wire accented with silver leaf ribbon and alcohol ink-stained acrylic bead sprays. 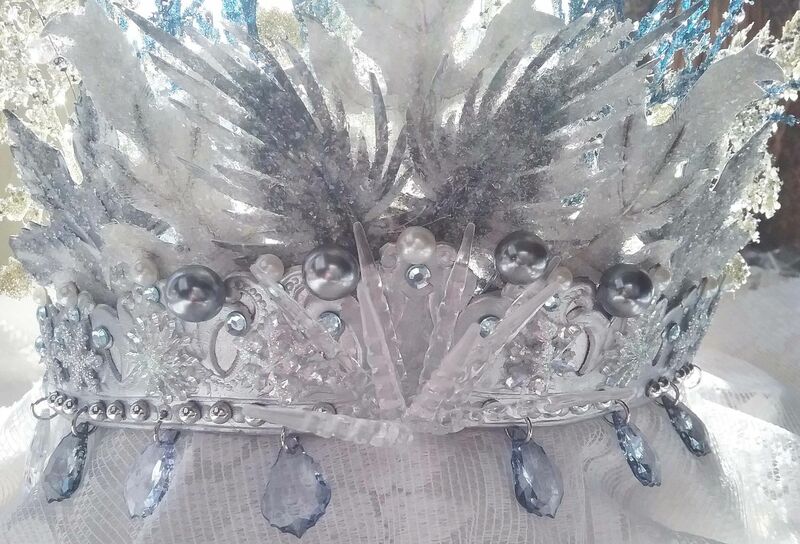 The front of the crown is made from a Dresden crown painted silver and loaded with sparkly leaves (from the new Silver Leaves collage sheet) covered in Twinklets Diamond Dust, glitter picks and wired beads. 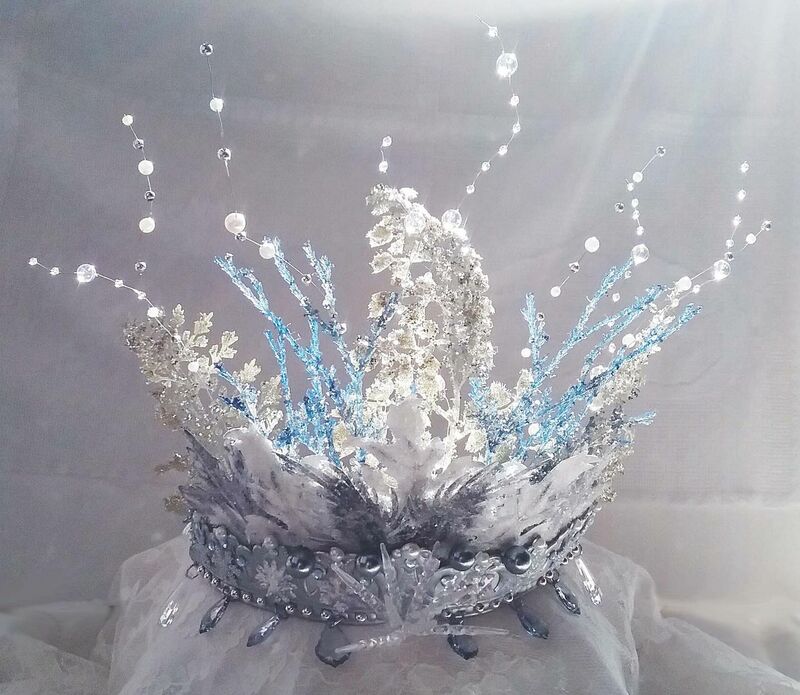 The front of the crown is decorated with flat-back pearl beads and stamen, rhinestones, alcohol ink colored acrylic teardrop charms hanging from the bottom and in the center is a burst of icicles made from mini icicle ornaments. Next up is the Star crown. 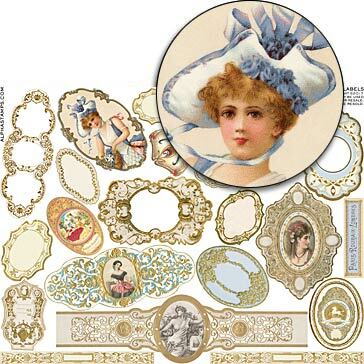 This simple to make crown is created by combining images from the Mini French Labels collage sheet (pictured below). 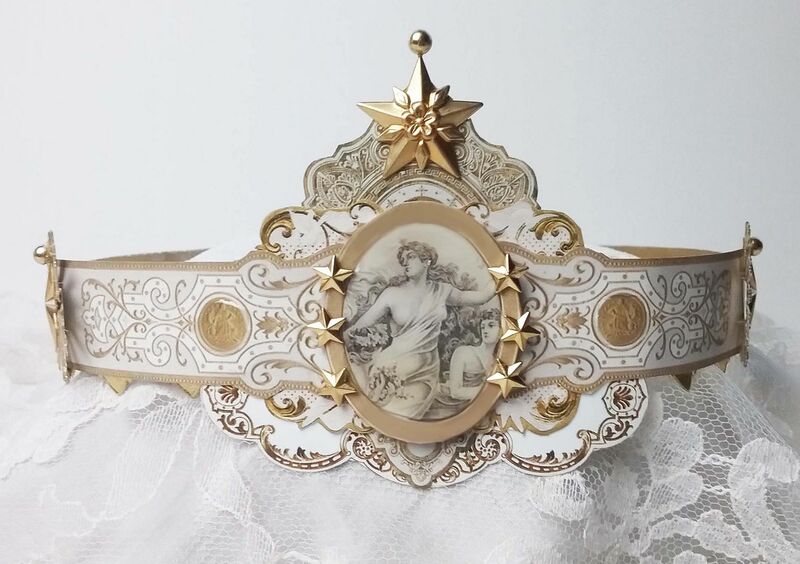 By gluing together several of collage sheet images, adding a bit of gold Dresden Zig Zag Edging and Halos, some brass star charms and star studs you end up with a beautiful crown. Notice how there is a large focal point on the front of the crown and a smaller one on the back. For an antique look, there is the Elegant crown. 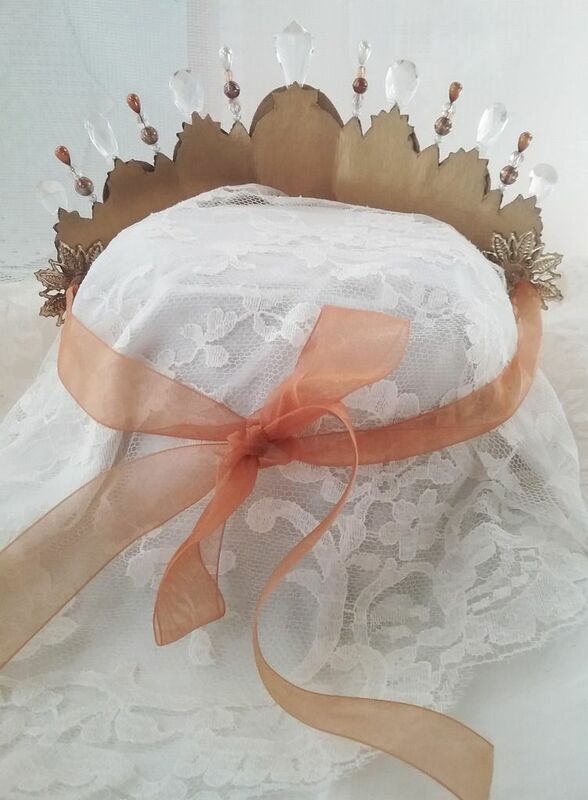 Just like the Ice Queen crown, the front is made using a Dresden crown. 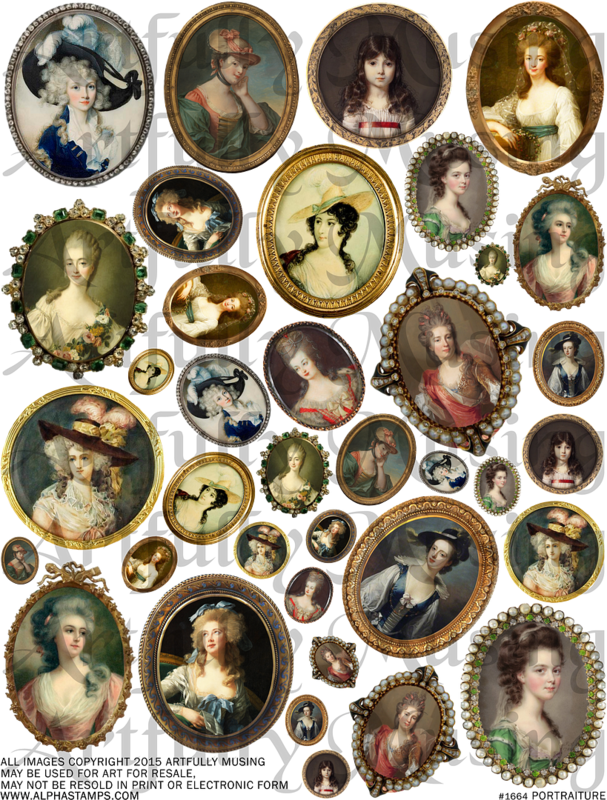 Showcased on the crown are images from my Portraiture collage sheet (pictured below). Additional accents are beaded stick pins, acrylic teardrop charms, and flat-backed pearls. 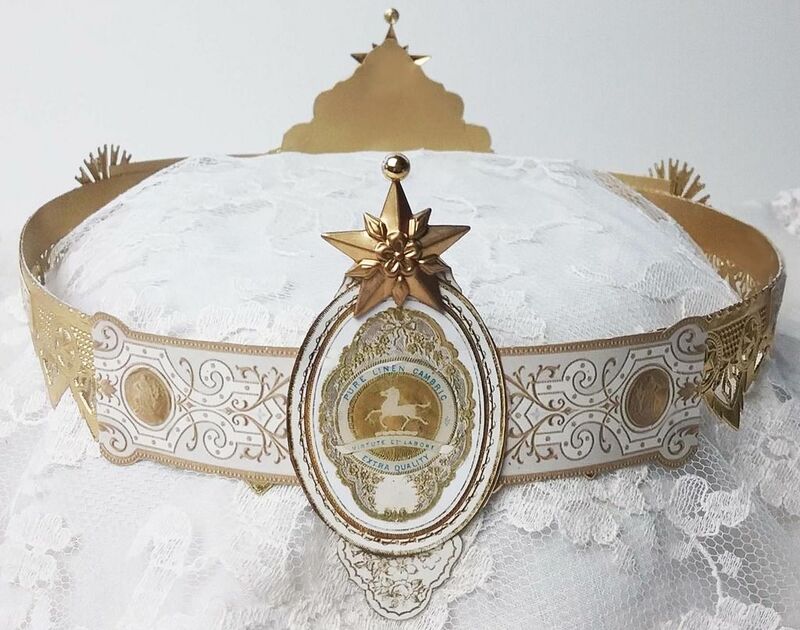 The crown attaches to the head with a ribbon secured to the front of the crown and accented with Dresden Rosettes. 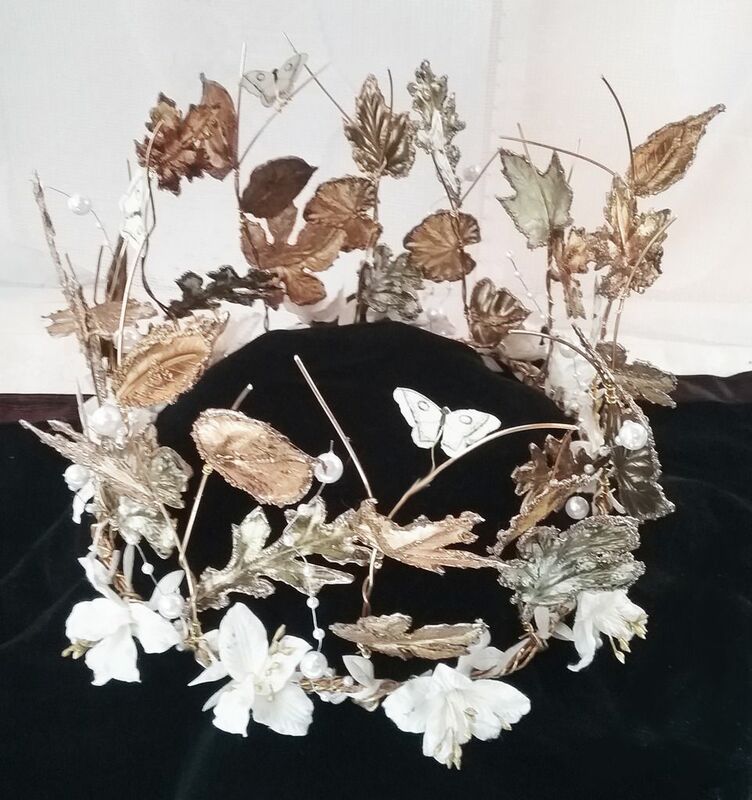 Lastly, is the Golden Autumn crown. 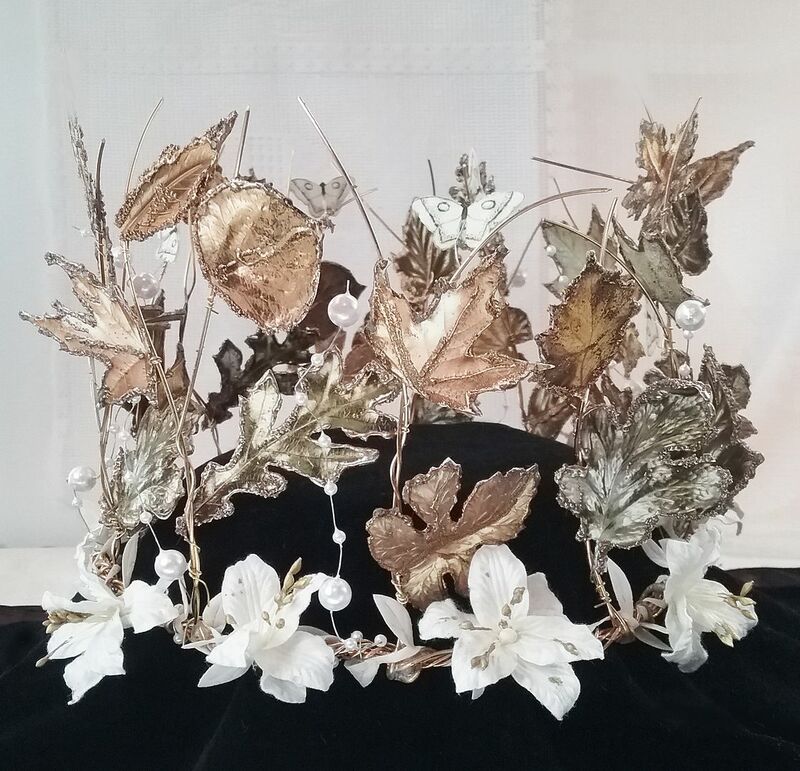 The base of the crown is wrapped 18 gauge gold wire accented with white stitched leaf ribbon and white mulberry paper lilies. 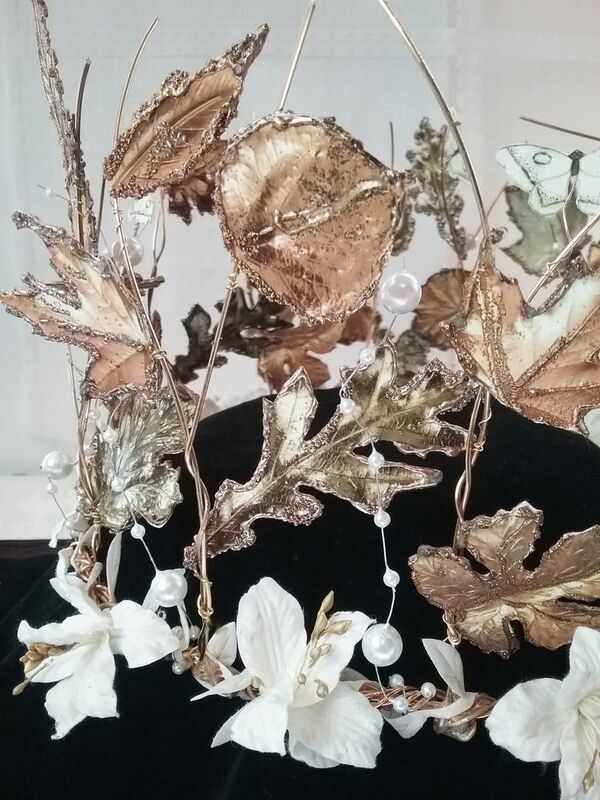 Sprigs of more wire rise from the crown wrapped in gold embossed leaves (from my new Gold Leaves collage sheet), wired pearls and butterflies. To complement the crowns I’ve created 2 new collage sheets and a new digital image set. These images would work well for any collage project. 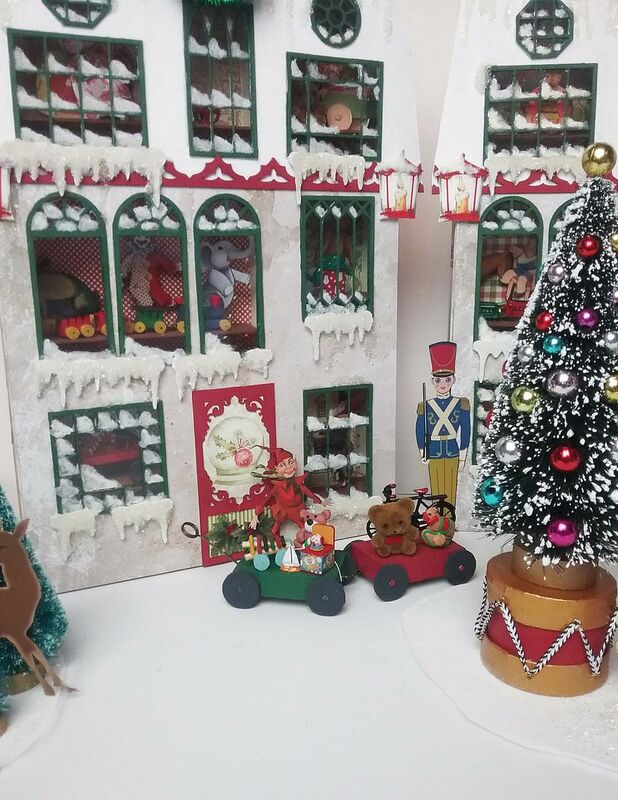 To jazz them up, add embossing powder, glitter, Stickles or Twinklets Diamond Dust. Make them bendable by attaching them to wire. 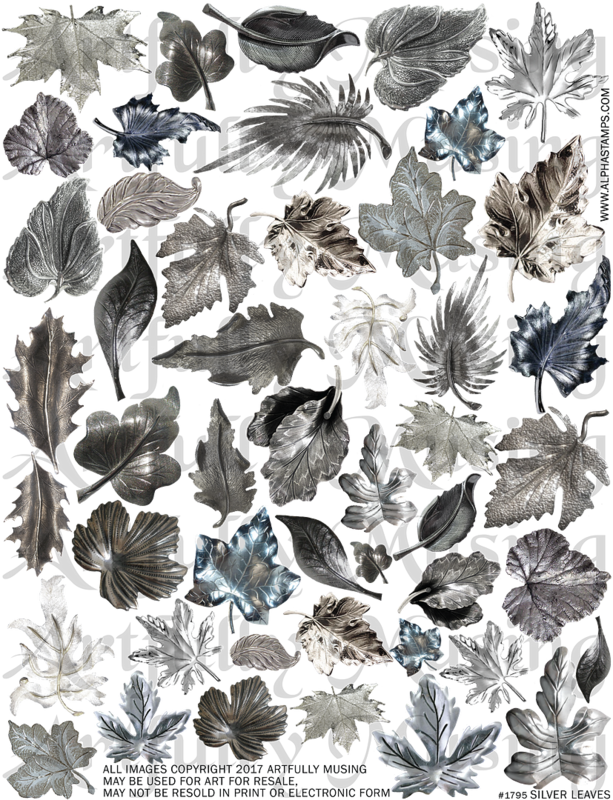 This sheet contains 21 unique silver leaf designs with duplicates in different sizes. 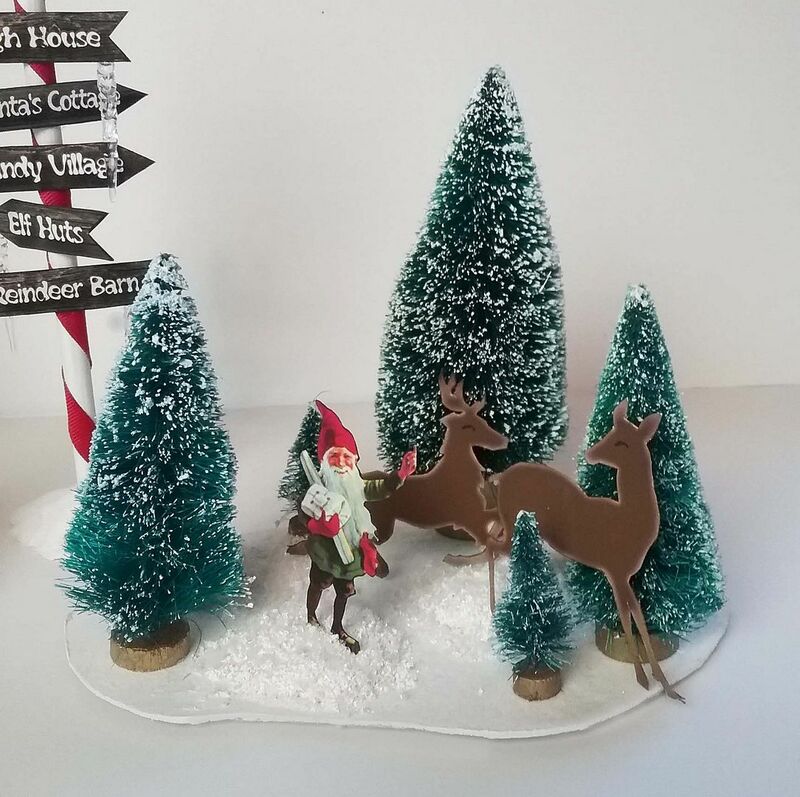 Add Twinklets Diamond dust to give the leaves an icy look or add silver embossing powder to the edges to give them a shiny accent. 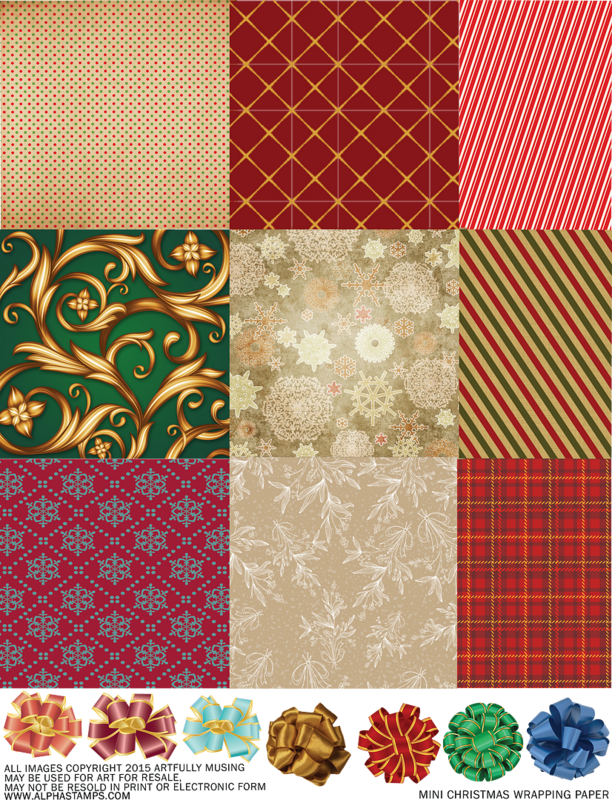 This sheet contains 17 unique gold leaf designs with duplicates in different sizes. Add Twinklets Diamond dust to give the leaves an icy look or add gold embossing powder to the edges to give them a shiny accent. 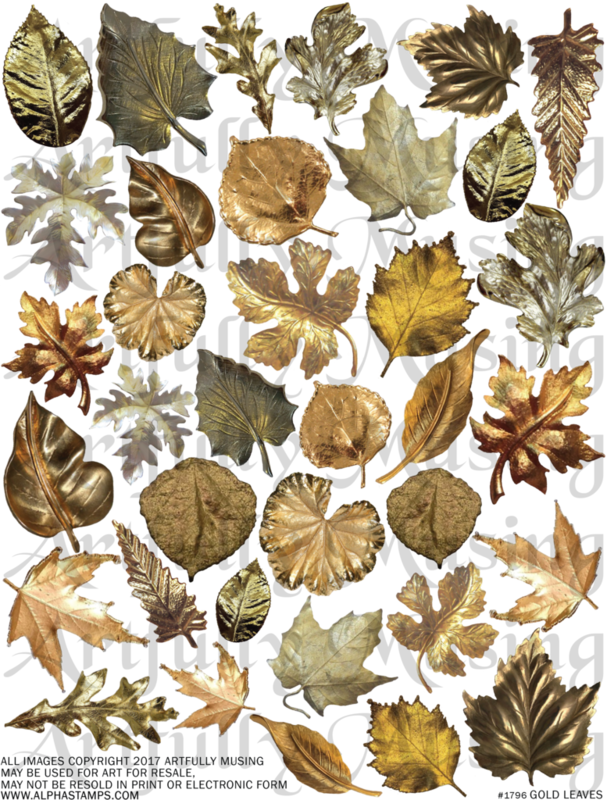 This set contains all of the leaves from the Silver and Gold Leaves Collage Sheets and 8 additional copper leaves for a total of 46 leaves. 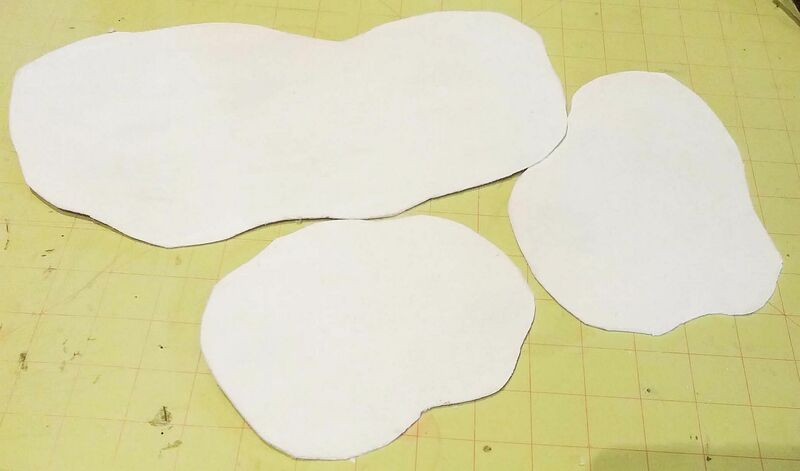 Each leaf is approximately 3” tall which gives you lots of flexibility in sizing the leaves for your project. Feel free to download and use the butterfly I used in my crown. 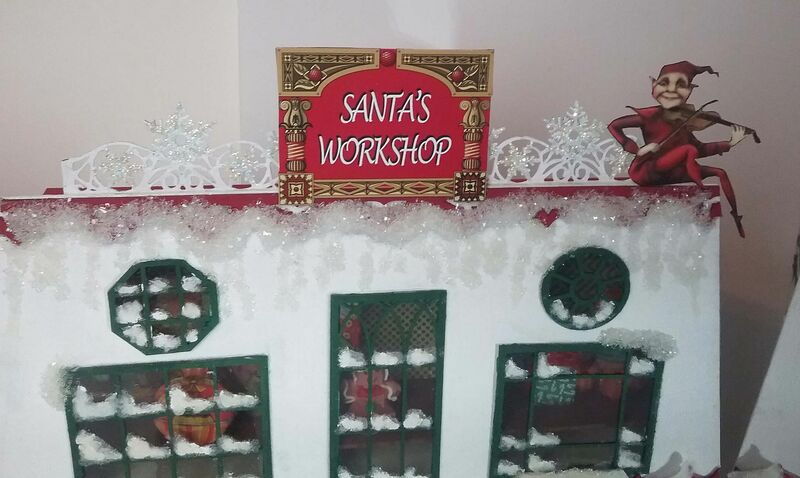 Things are hopping at the North Pole where Santa’s Workshop is in full swing pumping out toys. Everything in this wintry scene is covered in sparkling ice and snow. In the center is a decorated tree standing on a giant drum. 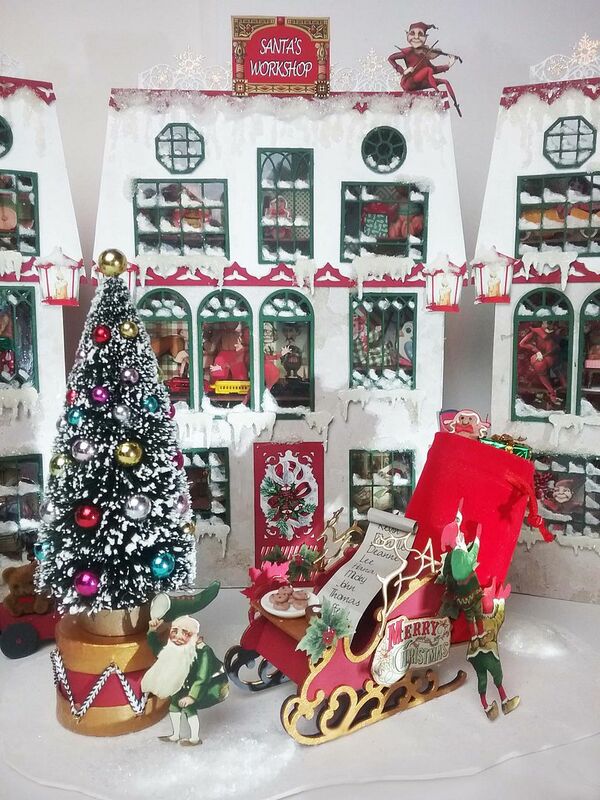 The elves are loading up Santa’s Sleigh with a bag of toys, chocolate chip cookies and a cup of cocoa. 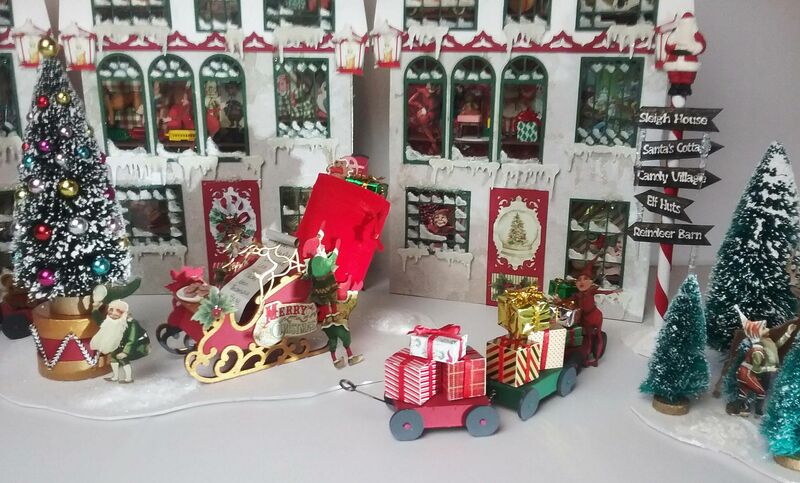 Using a pull train, the elves move piles of wrapped packages and toys. 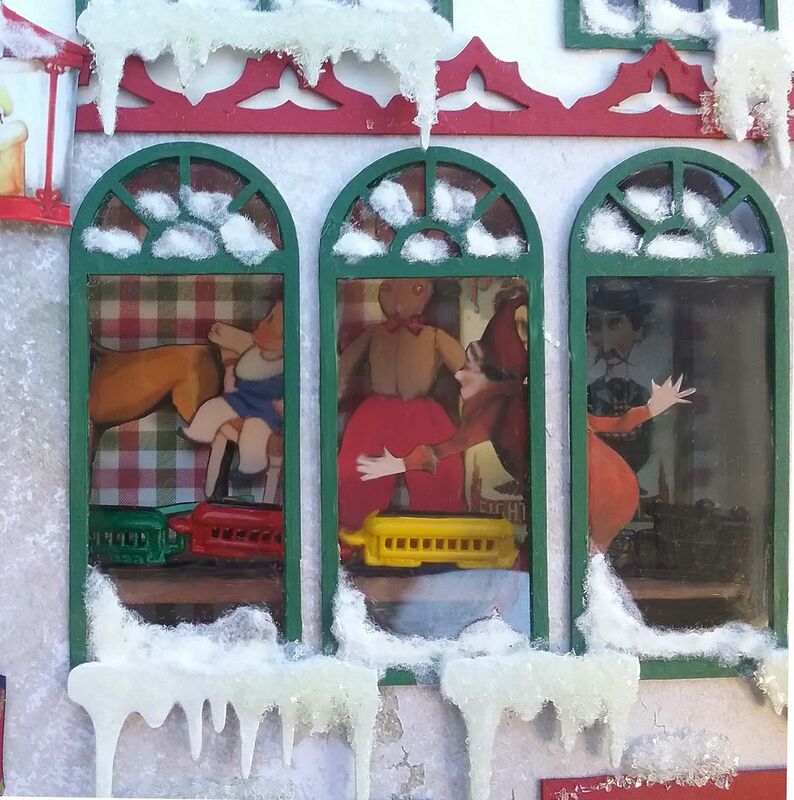 If you peek in the windows you'll see lots of toys and elves at work. 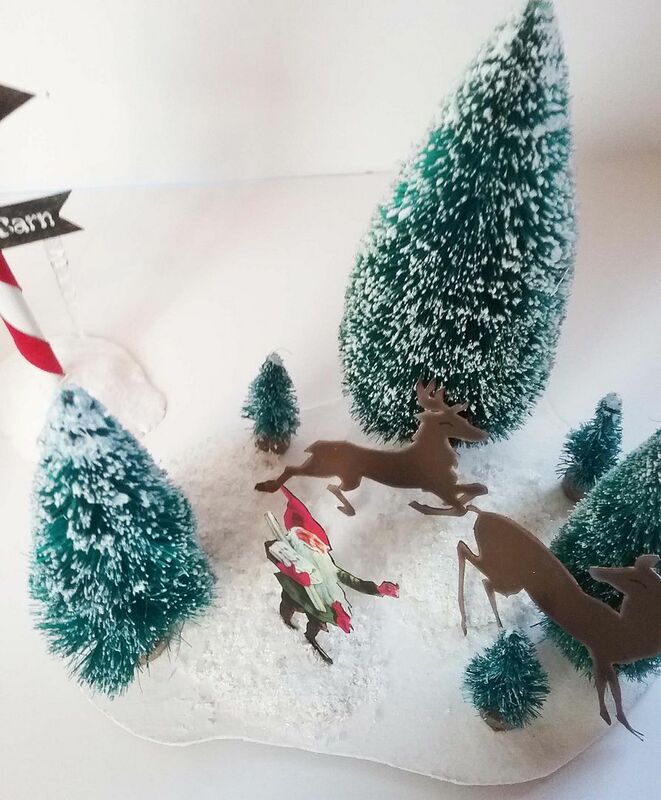 In the grove of trees, the elves are beginning to round up the reindeer. Santa’s doing his last minute check of his list. 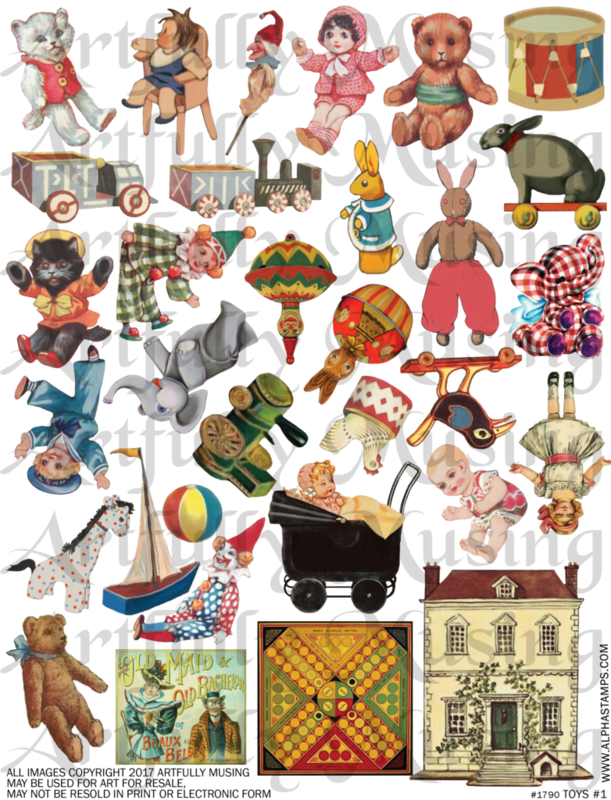 To complement this project I’ve create 4 new collage sheets, sheets filled with elves, toys and other things you might find at the North Pole. 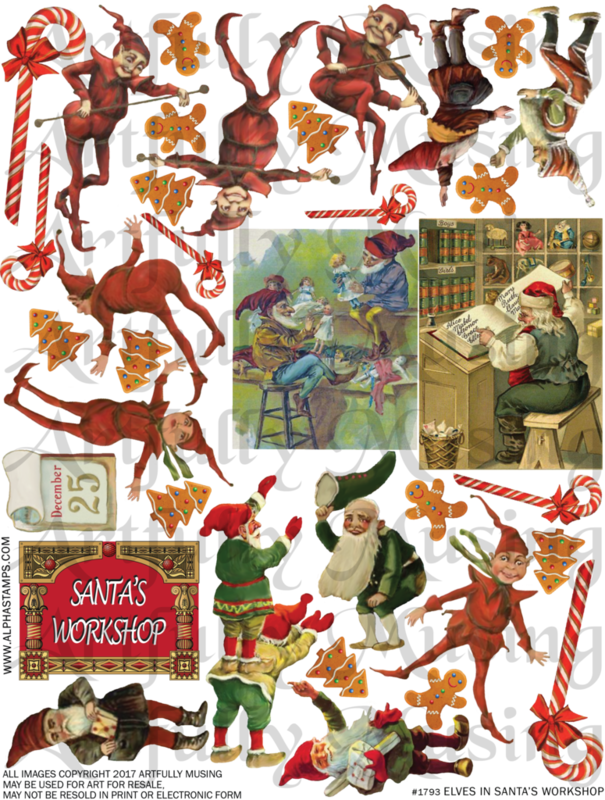 This collage sheet contains lots of elves, Santa in his workshop, candy canes, gingerbread cookies and more. This sheet is packed with toys and games. 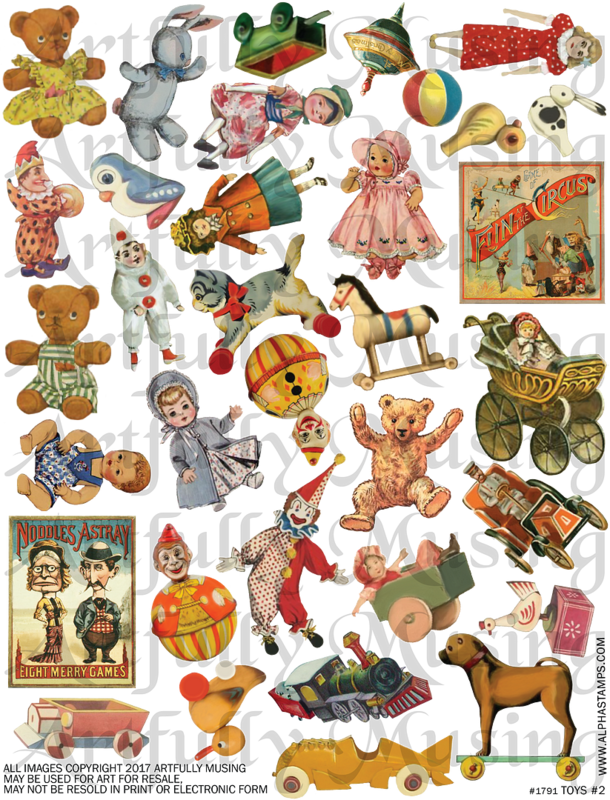 Toys, toys, and more toys; this sheet is packed with toys just like the first sheet. 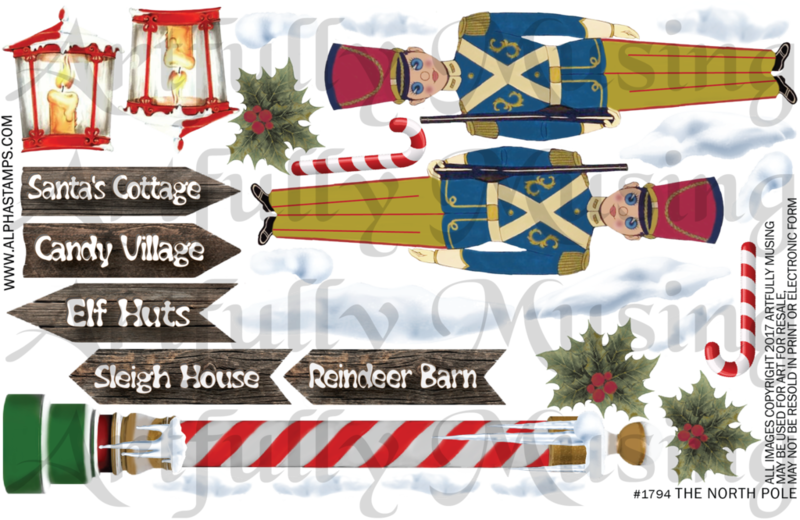 This half sheet contains things you might find at the North Pole. 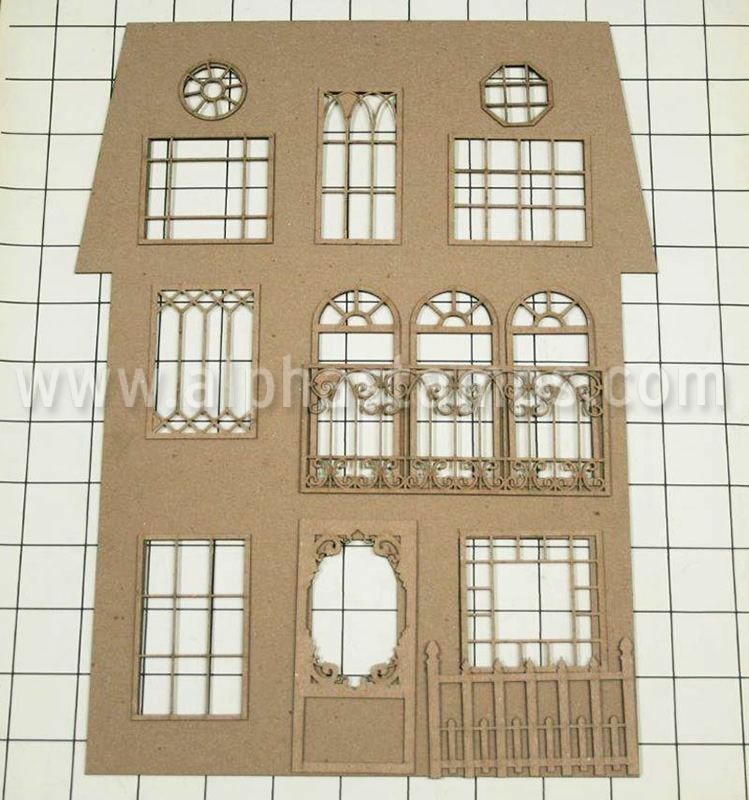 The bases of the buildings are made using the Large Haunted House Shadowbox and the Large Haunted House Window Trims. I started by painting the roof section white and then covering the bottom area with Chesterville Whitford Scrapbook Paper. I also painted the roof trim red and attached it to the facade. I then coated the roof area with Mod Podge and sprinkled it with white flocking. 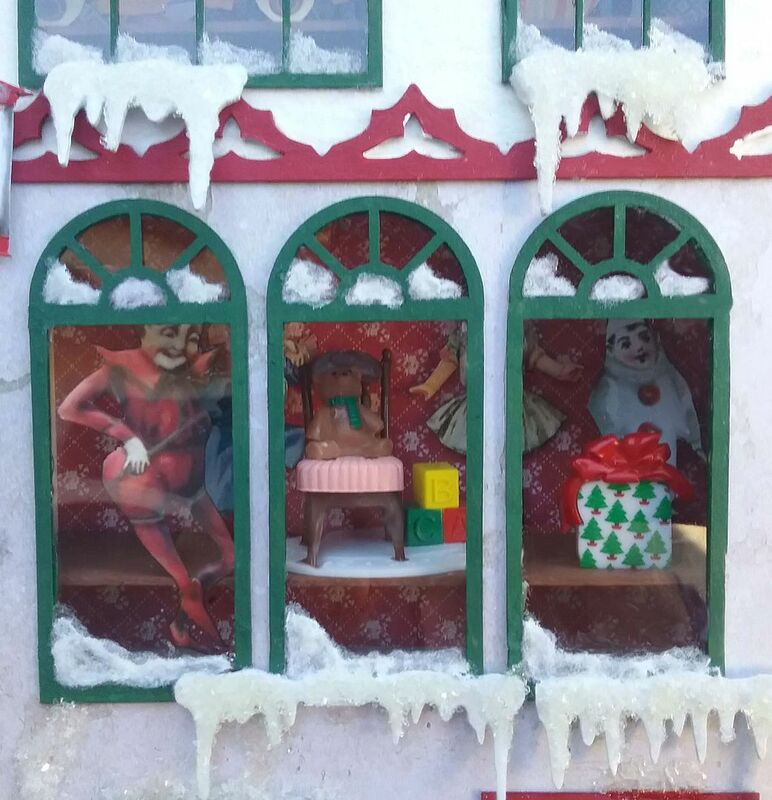 I painted the Large Haunted House Window Trims green and the doors red. 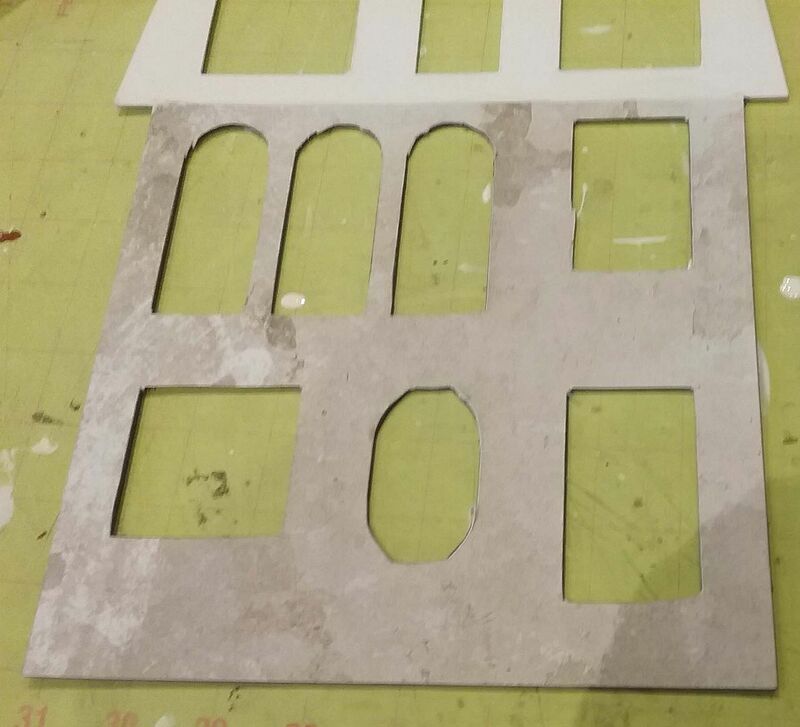 I backed the windows with 12 x 12 Clear Plastic for Windows, then glued the windows to the openings. NOTE: I also painted the edges of the window openings green before attaching the windows. 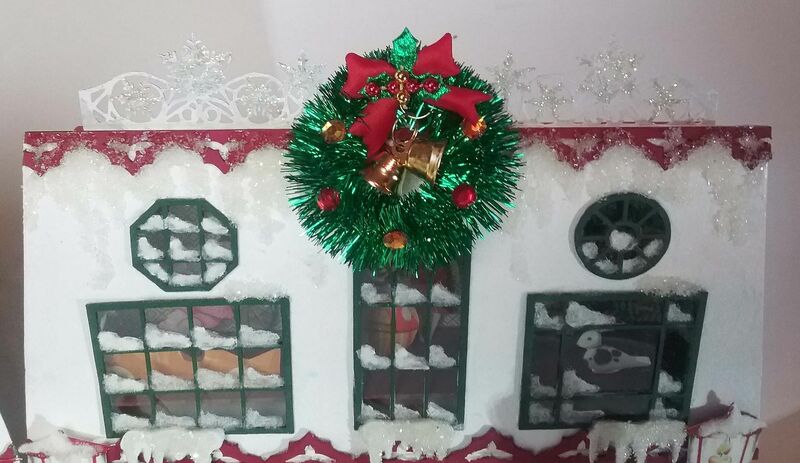 I painted the Icicles Roof & Winter Trims white, covered them with Glossy Accents and sprinkled Twinklets Diamond dust on top. I then glued them under the windows. I added white paint to the corners of the windows. Next, I applied Glossy Accents over the paint and then sprinkled white flocking on the Glossy Accents. 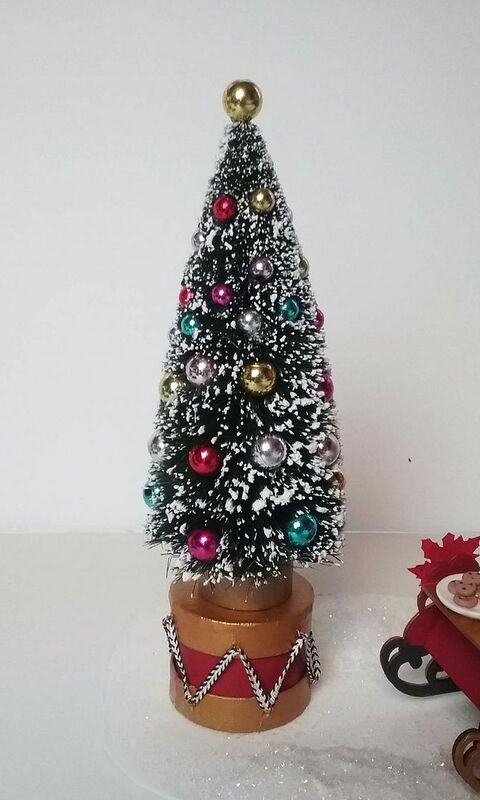 NOTE: To create ice and snow, I used three products; Twinklets Diamond Dust, Fluffy Snow Flakes and White Flocking. All of these products are somewhat translucent so it is important to paint the surface white first if you want these products to look white. 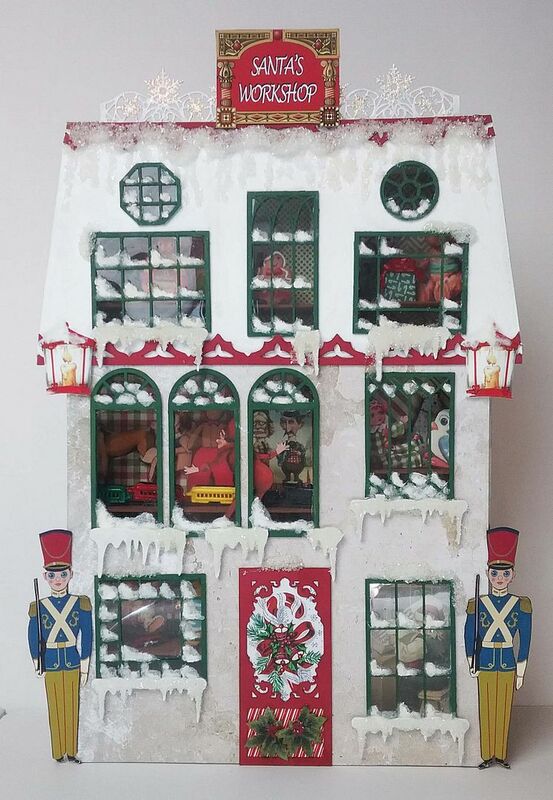 I applied Glossy Accents to various places on the facade and in a dripping direction from the top roof trim. I then sprinkled Twinklets Diamond Dust on the Glossy Accents giving these areas the look of ice and icicles. Note: this is the only time (papered area of the facade) that I did not paint the surface white before adding the Diamond Dust as I wanted it to look more like ice. To the top, I added a Snowflake Border that I painted white and then used Diamond Stickles to accent the snowflakes. 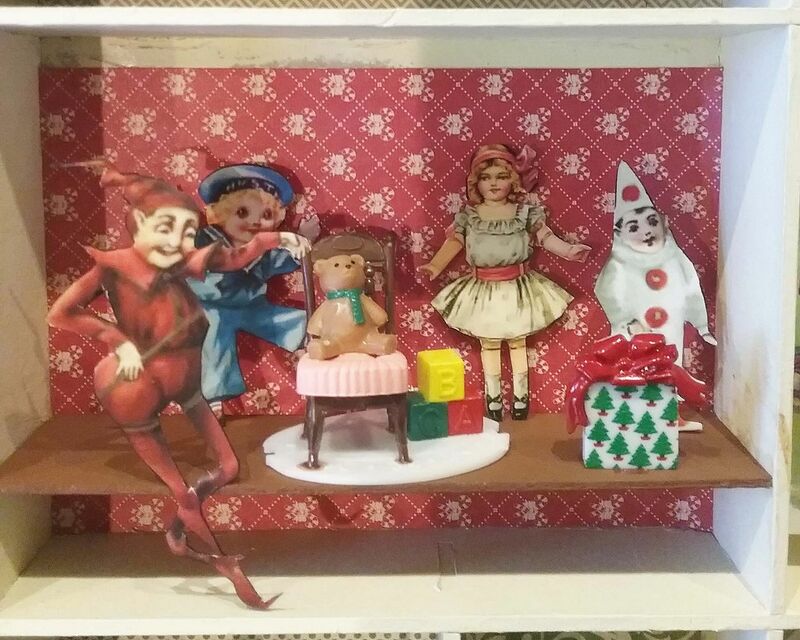 Next, I assembled the shadowbox, covered the outside with paper and painted the inside a cream color. 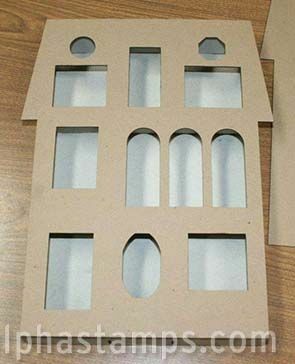 I suggest using a light color so that once you attach the façade the opening will be as bright as possible inside. 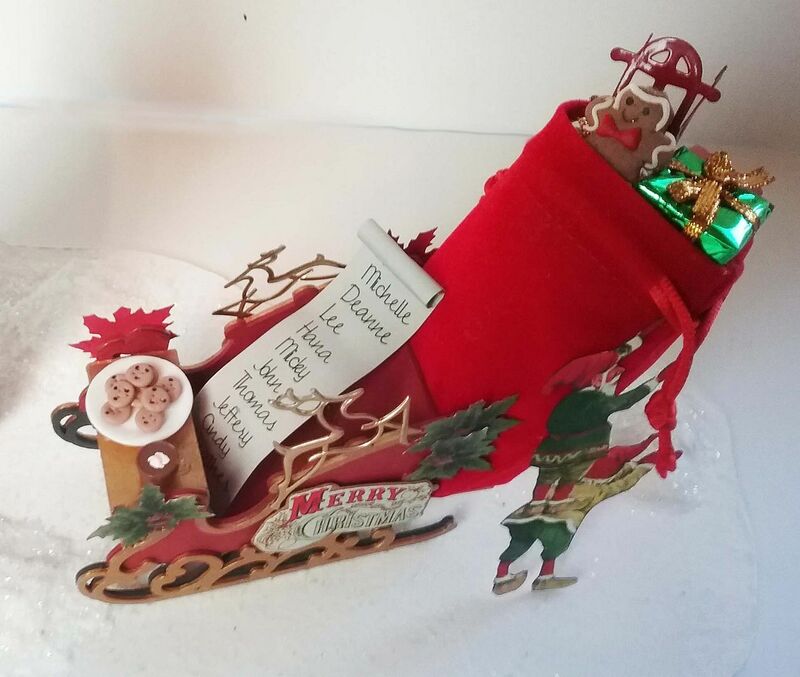 I added Christmas themed paper to the inside; this is the same paper I used for the previous Christmas Ornament project. You don’t need to worry about the paper going to the edges of the cubbies, as you will not see all of the opening once you add the façade. 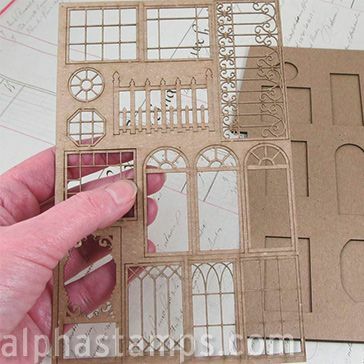 NOTE: If you plan to hinge the façade to the shadowbox, make sure the paper and or paint completely cover the cubbies. 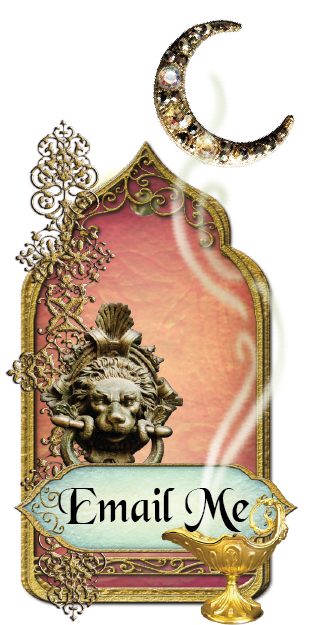 As noted above, once the façade is attached to the shadowbox, you cannot see all of the area within each cubie. 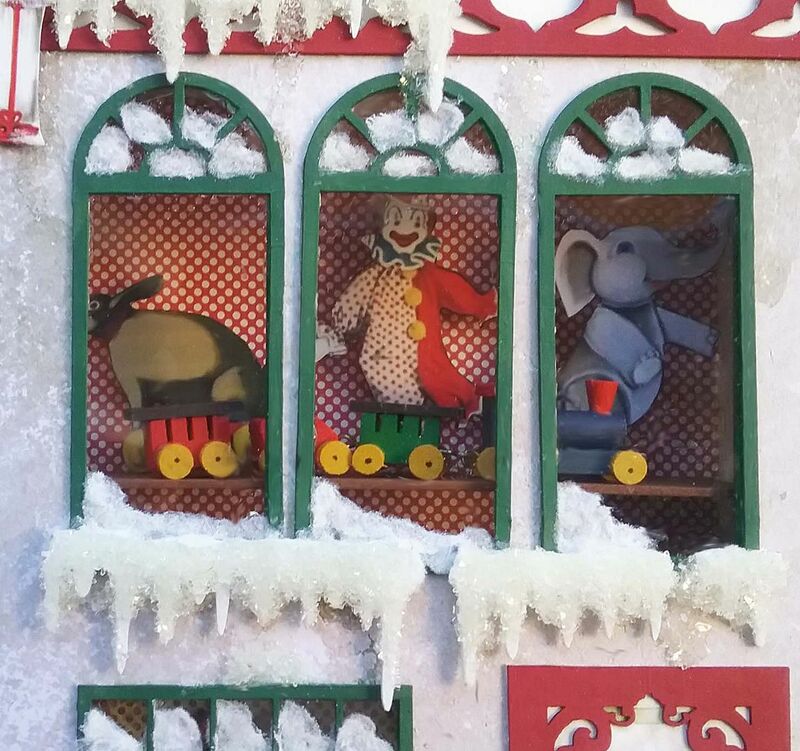 It’s important that before you add the toys, figure out what part of the opening shows through the window. 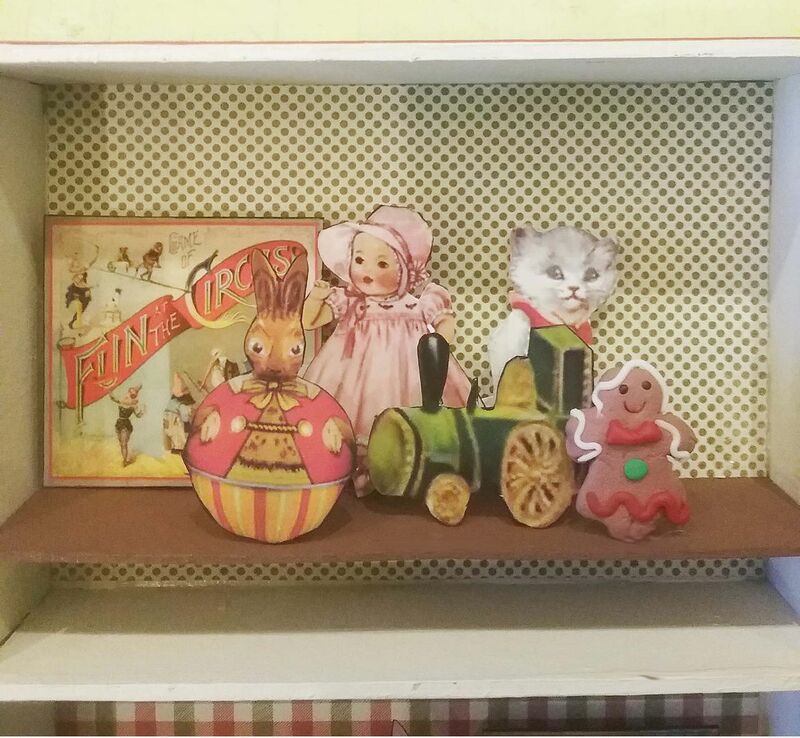 Once I made that determination (by laying the facade over the shadowbox), I added chipboard shelves. 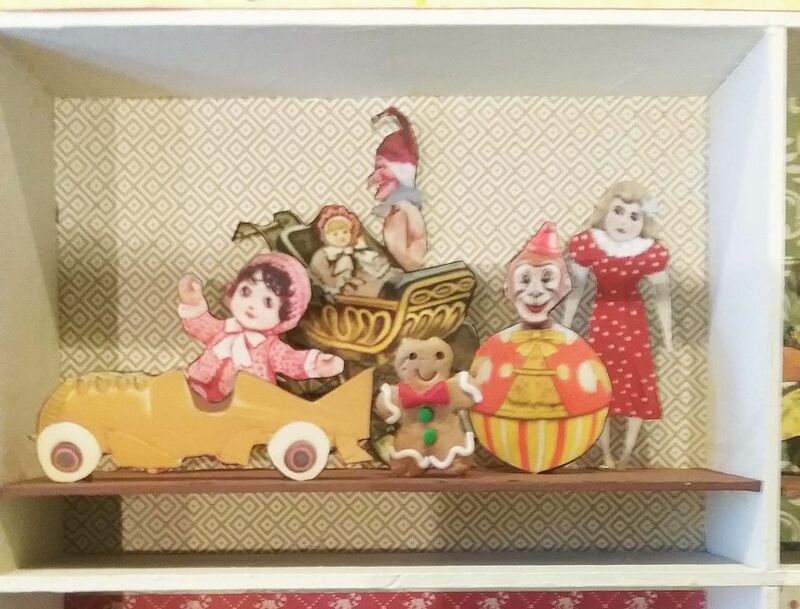 For the toys in the windows, I used both 3D miniature toys and paper toy images from the new collage sheets. To attach the toys to the cubie/shelf, I used foam tape, pop dots, and flat beads. Some of the images are attached to the wall, to some I added a flat bead and attached them to the shelf. The 3-D toys are glued to the shelves. 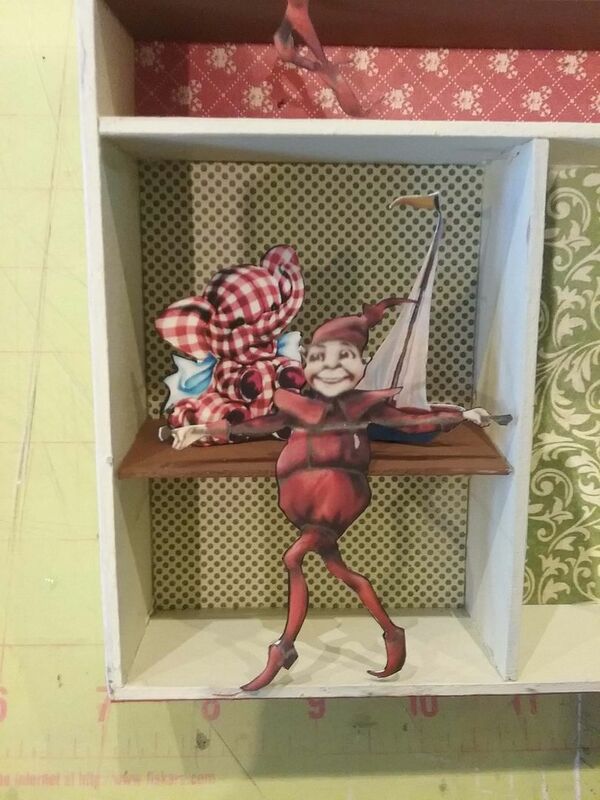 I attached the elves to the front of the shelves. 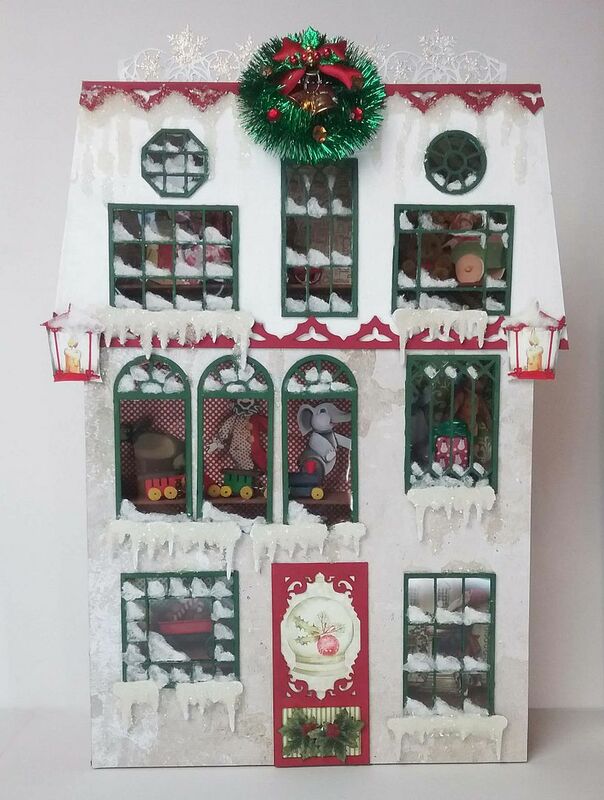 Lastly, I glued the façade to the shadowbox. 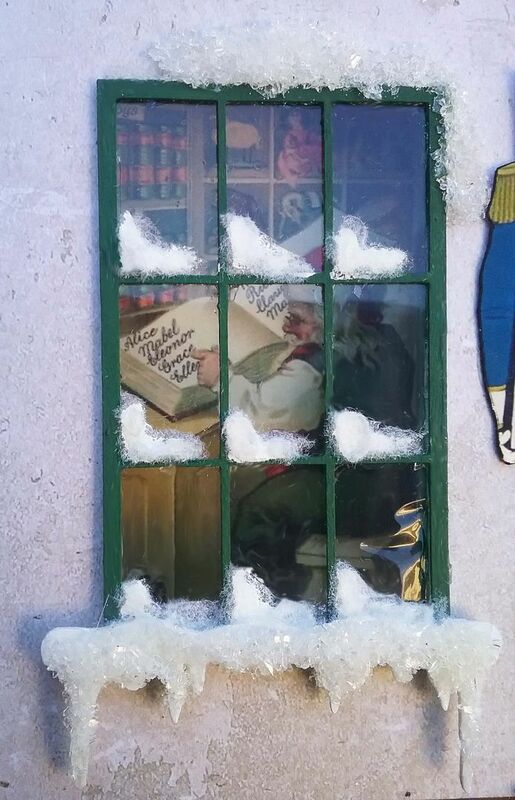 The final touches to the façade are the “Santa’s Workshop” sign, wreath, paper lanterns and the paper soldiers. 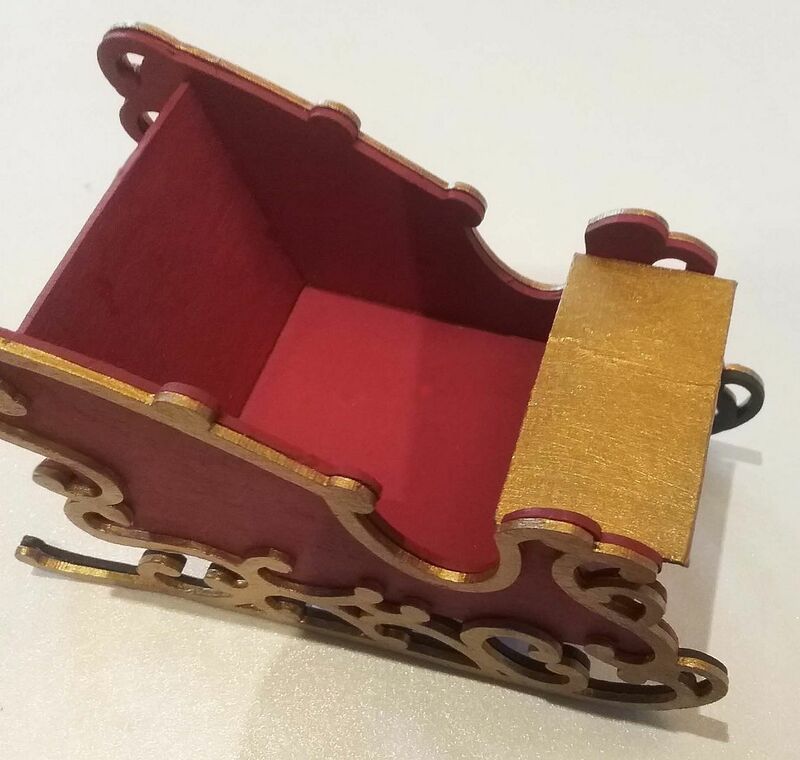 The sleigh is made from a chipboard kit which I painted red and gold. 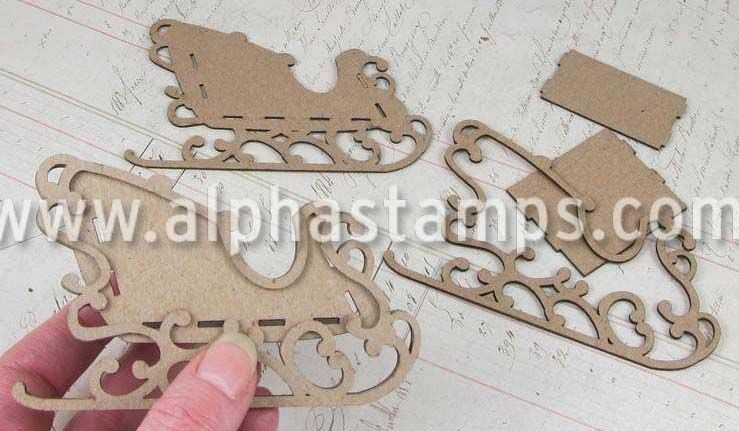 I cut two pieces of chipboard, one to serve as a ledge on the front and one to accommodate the bag on the back. 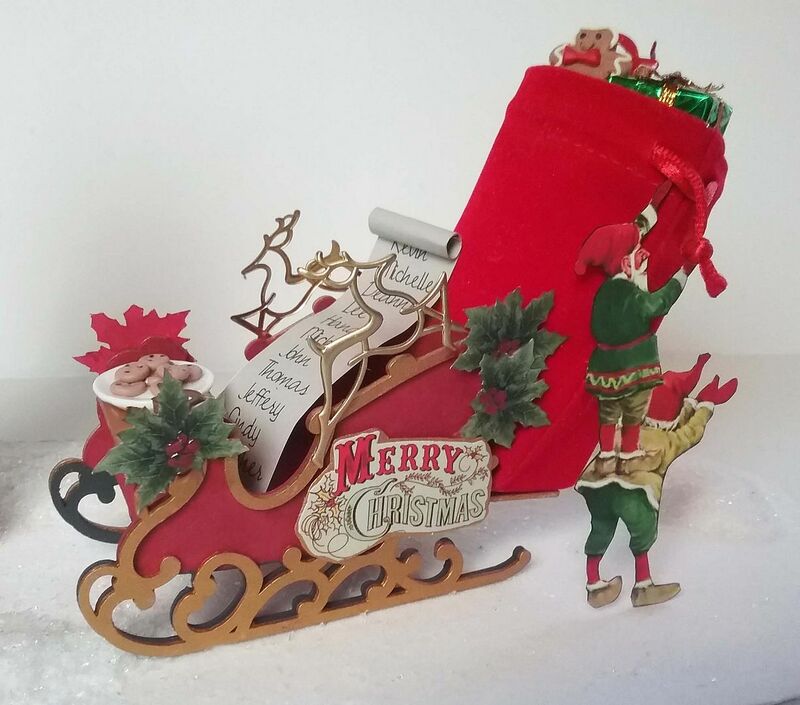 To the sides of the sleigh, I added greenery from the collage sheets, metal reindeer from my stash and a Merry Christmas sign which is at the bottom of this post (that you can download and use). The bag in the back is a red velvet jewelry or gift bag. I stuffed the bottom with tissue paper. 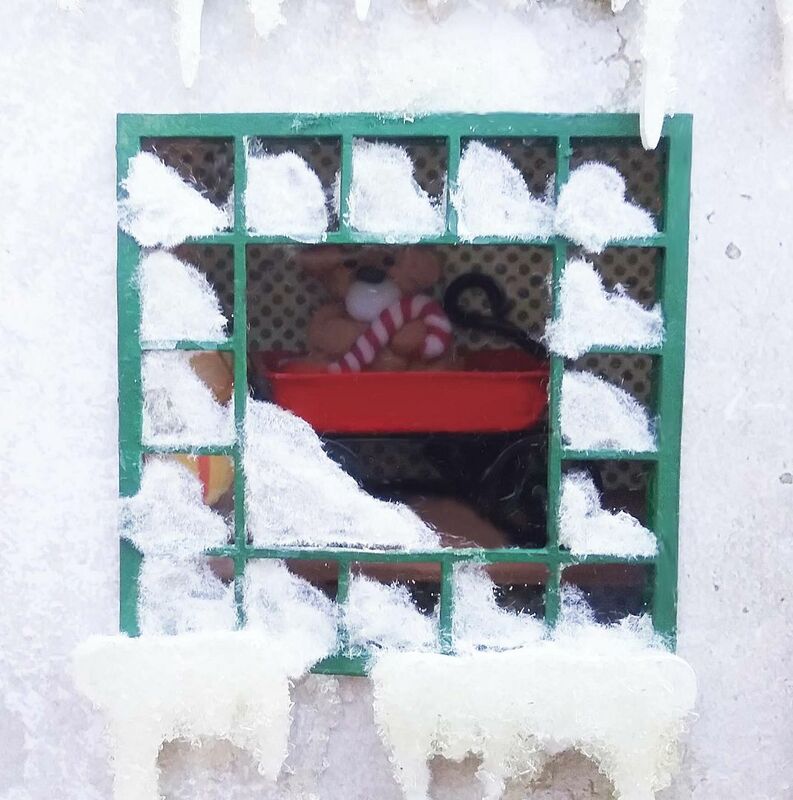 I inserted packages, a gingerbread boy, and a toy sled. 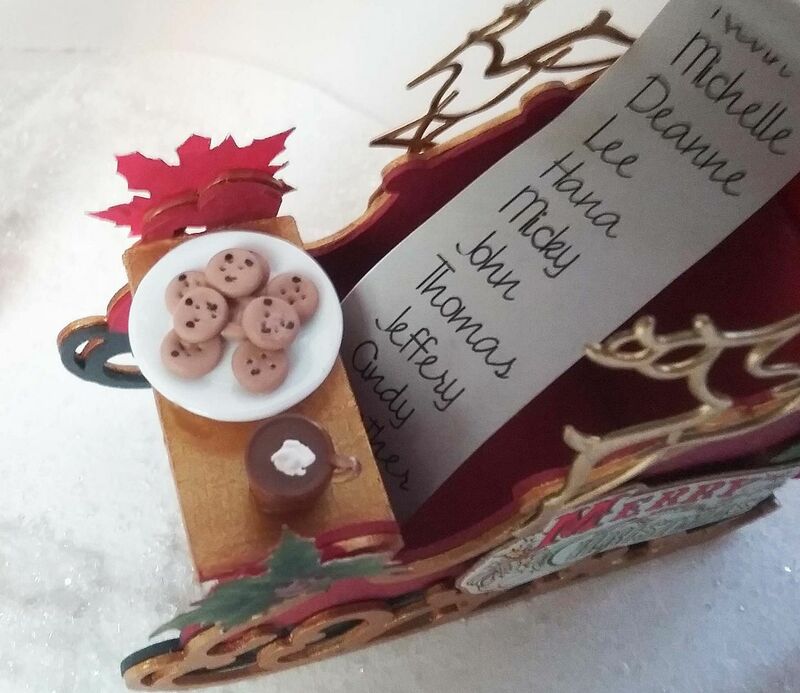 On the front ledge, I added a tray of cookies and a cup of cocoa. I filled the cup with brown paint and then added a dab of white paint to serve as whip cream. The trains are made from a chipboard kit. 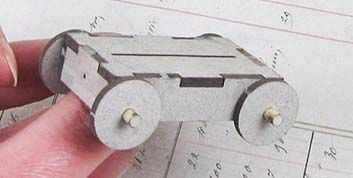 This kit can also be used to create a pull-toy. 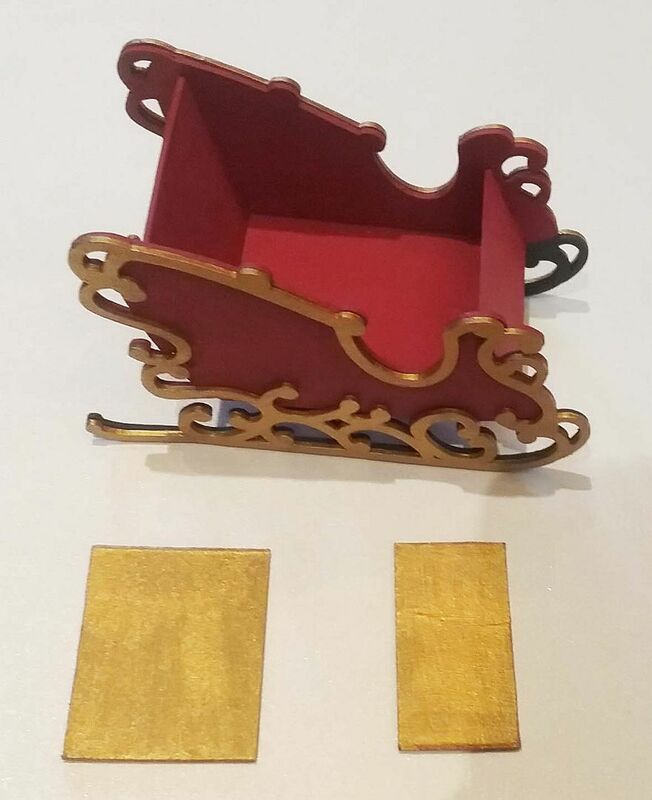 I decided to connect two pull toys together for transporting toys to the wrapping department and connected three together for transporting wrapped toys to Santa’s sleigh. 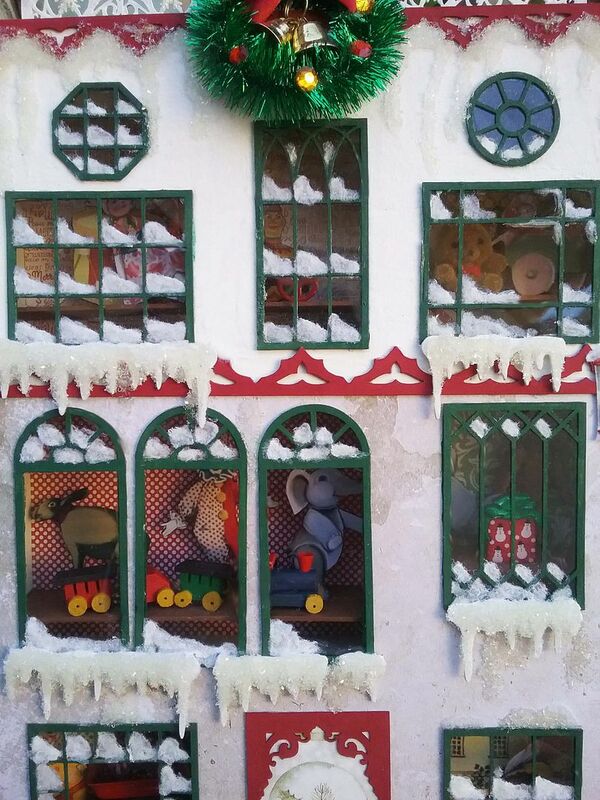 Alpha Stamps is carrying all of the cute miniature toys in the windows, on the train, and in Santa’s bag. Some of the packages are made by wrapping wooden boxes. 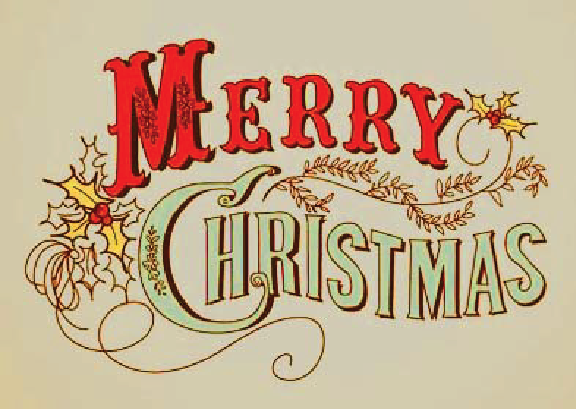 The paper I used is from a free wrapping paper collage sheet that you’ll find at the bottom of this post. 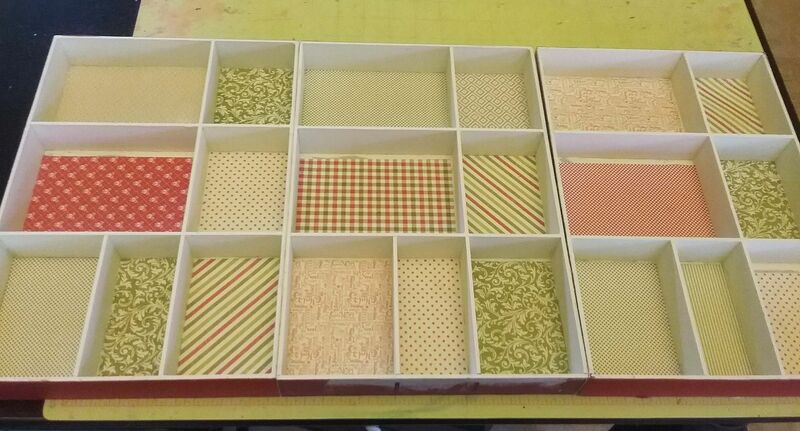 I also made boxes from the Holiday Bags, Tags & Boxes Collage Sheet plus some foil-wrapped gift boxes. 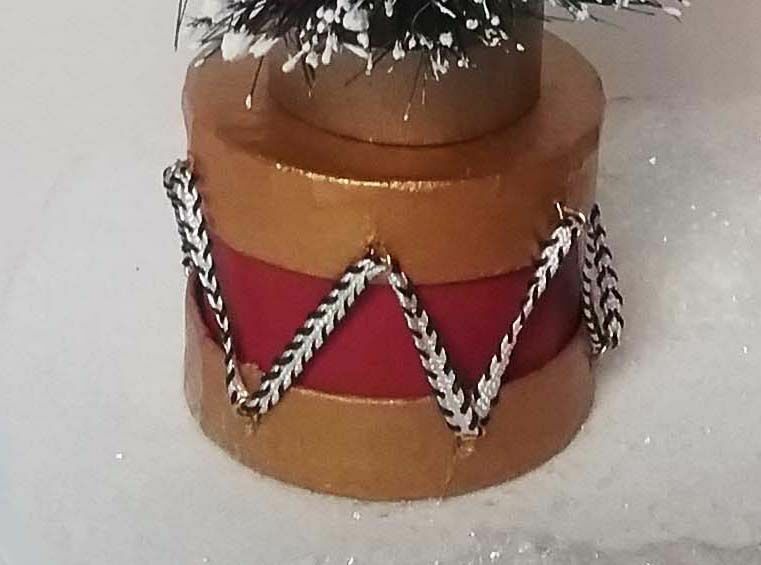 I decided that the decorated tree would look great on a drum base. 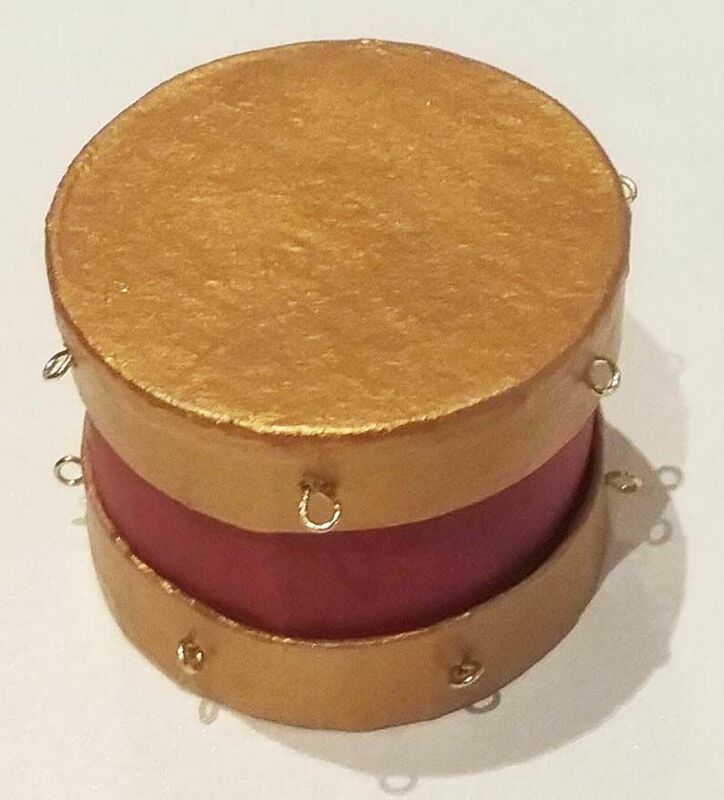 To make the drum, I started with a round paper mache box and a lid from another box. I painted the middle section red and each lid gold. 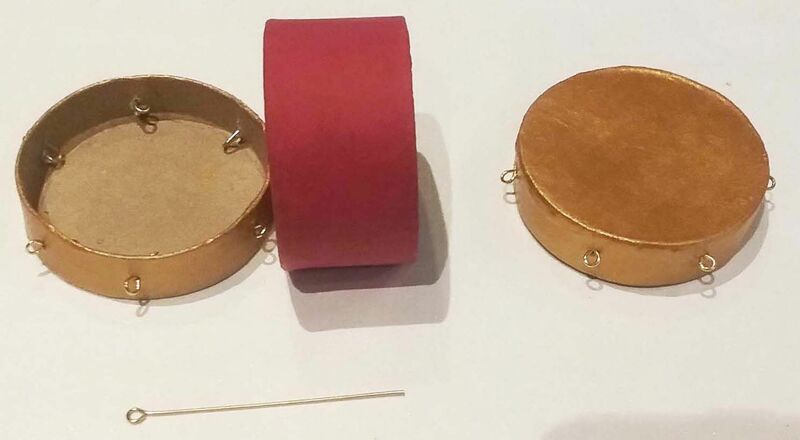 To accommodate the ribbon I added eye pins around the outside of the lids. 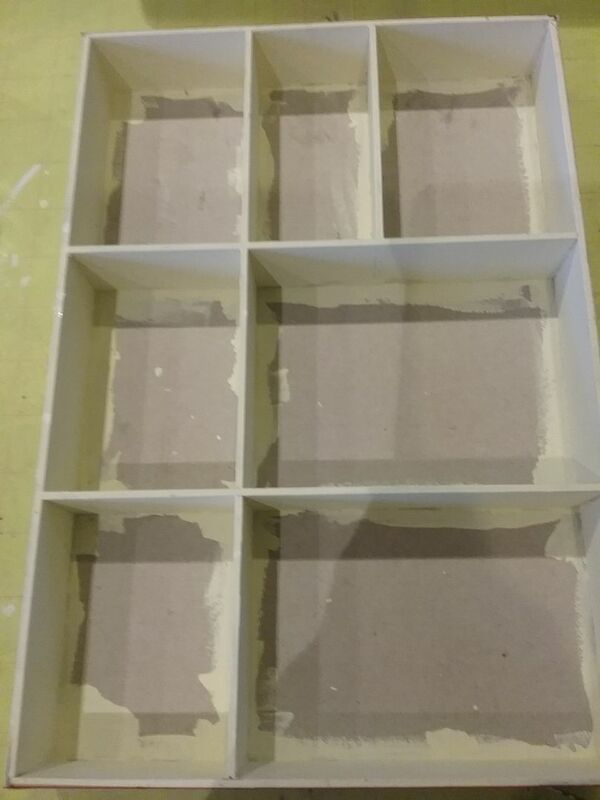 I glued one lid to the bottom of the box and one to the top of the box. 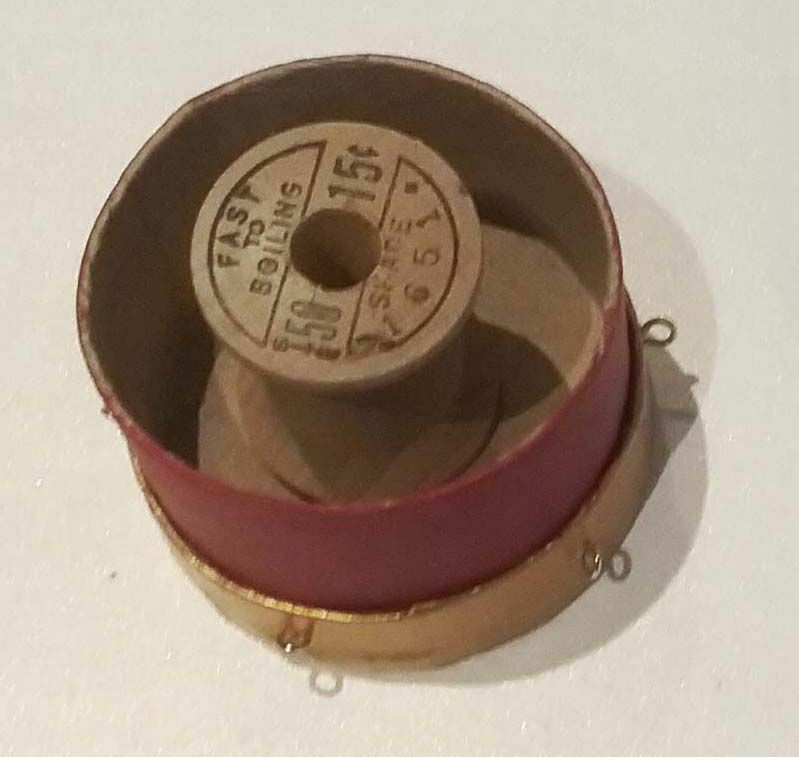 The reason I used a spool on the inside, was to keep the top lid from sliding too far down on the box. Lastly, I strung ribbon through the eye pins. I used paper clay to create mounds of snow. I painted them white and added the flocking the same way as I did to the bases. 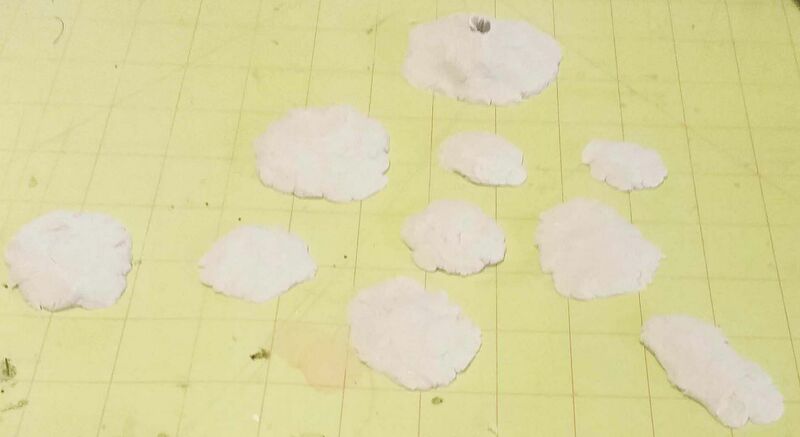 Next, I glued the clay to the bases, painted them with Mod Podge and sprinkled them with fluffy winter snow. 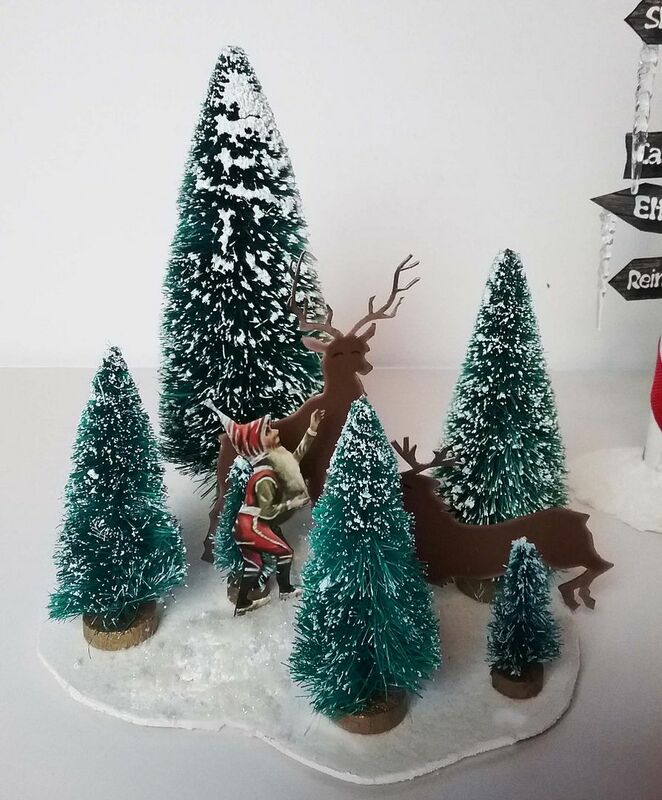 I glued the trees to the base and added reindeer from my Winter Wonderland Collage Sheet. 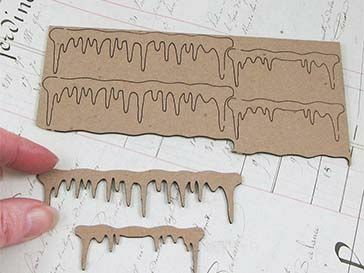 It's easy to add images by cutting slits in the clay mounds and gluing the images in place. 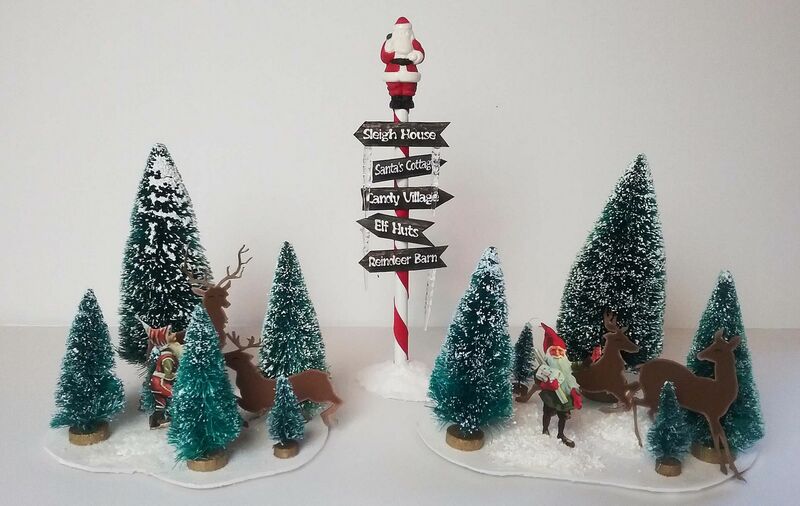 The pole is made from a wooden dowel, painted white, wrapped in red ribbon and glued into a clay base. NOTE: To create a hole for the pole, I inserted the dowel into wet clay. Once the clay dried, I glued the pole in place. 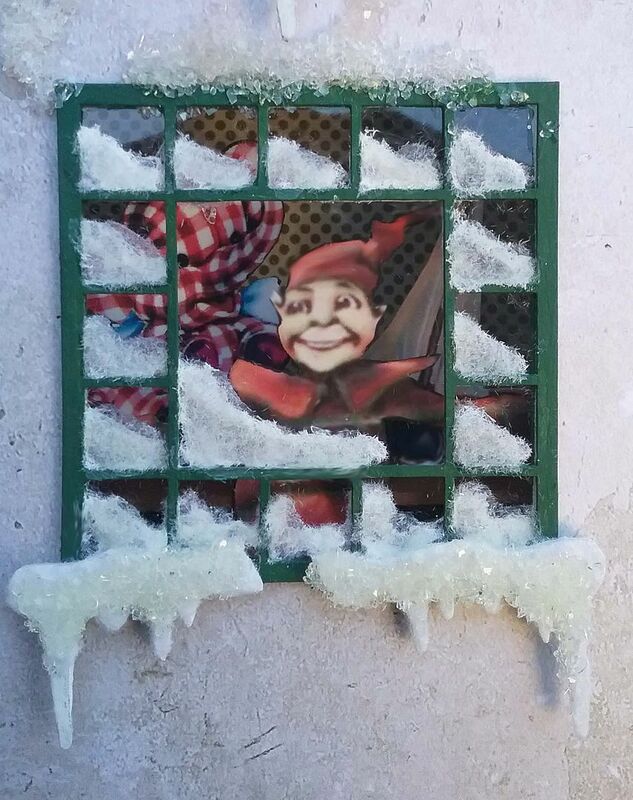 The signs are from my Elves in Santa’s Workshop Collage Sheet and have clear mini icicle ornaments dripping from them. At the top is a Tim Holtz Salvaged Santa painted with acrylic paints. 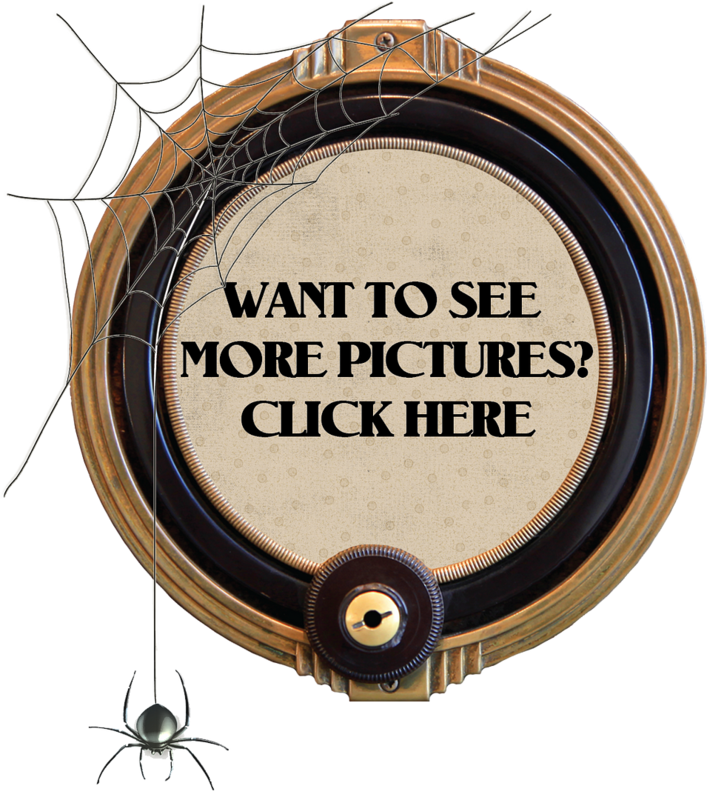 Feel free to download the images below and use them in your projects.